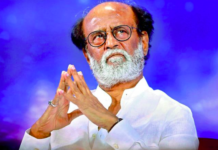 Kaala has Rajanikanth sending out loads of political messages. Rajanikanth’s latest movie Kaala released at wee hours this morning in Tamil Nadu and at reasonably comfortable timings in other states. The movie is loaded with political overtones and deals with contemporary issues like corruption, bribery, black marketing, building lobby, middlemen, cleanliness, among other topics. Of course, there is this one-man army to solve all issues plaguing society; and it is the man in black Rajanikanth. The movie sounds like a launchpad for Rajanikanth into politics. This is one of the rare movies that did not see a pre-launch hype like his earlier releases. Kaala ran into a bit of a problem in Karnataka. Pro-Kannada activists tried to block the movie from being screened. But Kaala made a quiet entry into malls in Bengaluru amidst tight security. Rajani fans were ready to go to Hosur to see the movie, but that was not needed. Previous articleIs RSS Grooming Pranab Mukherjee for 2019? Madras Turns 379 Years; Or is it 2000 Years Old?